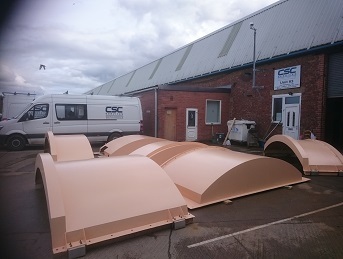 CSC Services have recently completed a job for client EDF Energy to repair and apply protective coatings to Ferrous Sulphate Tank Lids and Steel Walkway gratings. 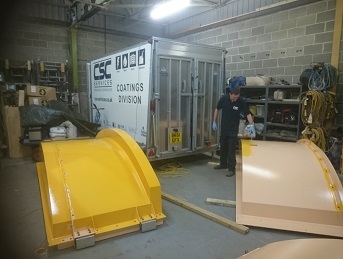 The tank lids and walkway gratings were transported from Hartlepool Power Station to the CSC Services work unit for the refurbishment work as part of a plant upgrade. 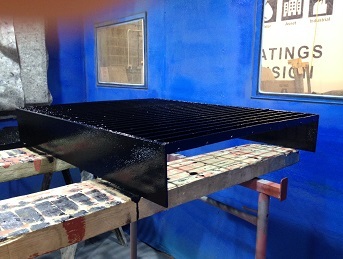 The steel gratings were grit blasted to provide the correct surface profile for the application of marine grade protective coatings to be applied. This was specified to protect against chloride attack at the coastal location of the power station. The images below show the work in more detail. 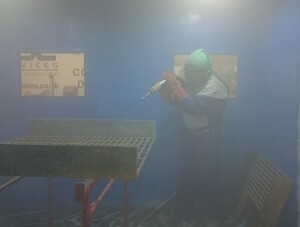 Abrasive blasting equipment was used to remove failed coatings from the Ferrous Sulphate Tank Lids. New marine grade GRP protective coatings were applied, again to protect against salt and chloride attack. This consisted of a primer undercoat and top-coat. 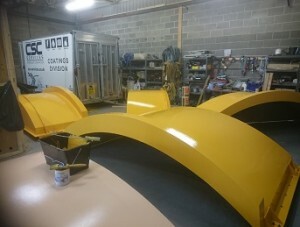 Two clear protection coats were applied before waxing and polishing to complete the job. CSC Services are offsite industrial painting contractors who have many years of experience preparing and coating pipework and various other structures. Structures, pipes or equipment of up to 3m wide can be forklifted in and out of the specialist unit. Structures can be shot blasted or painted to any specification at the CSC Services unit in the North East and a range of polyurea coatings are available. 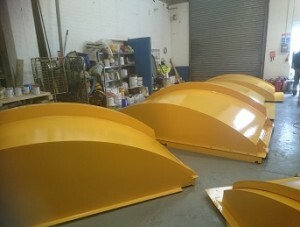 To discuss your offsite repair and/or coating requirements call us on 0191 410 3444.